Living in SOMA: South Orange Maplewood; Making the Move! Today, friends, neighbors and a truly wonderful family that has been living in Maplewood for 12 years will be making the move to South Orange. With four girls, they had outgrown their lovely College Hill home. We had been looking on and off over the past few years, but when they found their new home on Scotland Road, with 2 more bedrooms, 2 more full baths--one a master bath--it was almost too good to be true and made this move irresistible. We made their offer on the new home and successfully negotiated a deal that was contingent on selling their home, which wasn't even on the market as of yet. We mobilized and got their home on the market in less than 2 weeks and on the first weekend had two open houses, bringing in over 50+ potential buyers and ended up with 11 bids and selling their home for 10% over asking. While this was a great outcome to feel great about, this wonderful turn of events was bested by what I believe is the first ever Official Greeting and Neighborhood Welcome from none other than Sheena Collum, South Orange's first female Village President. Living in Montclair: Who took the First SELFIE? 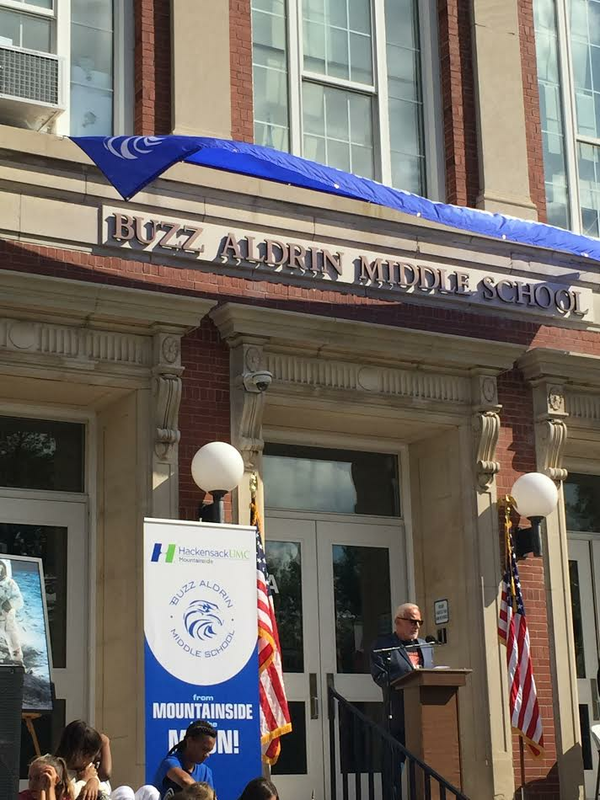 Well, None Other Than Montclair's Own Astronaut and Moonwalker--Buzz Aldrin. 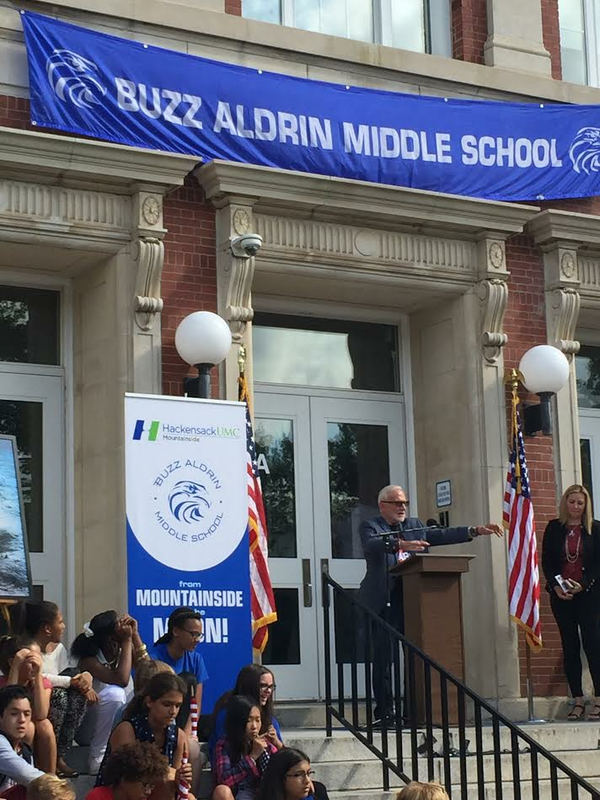 MONTCLAIR, NJ — Montclair was recently abuzz with the renaming of Mount Hebron Middle School on Sept. 16 to Buzz Aldrin Middle School. "Buzz Aldrin grew up in Montclair, New Jersey. 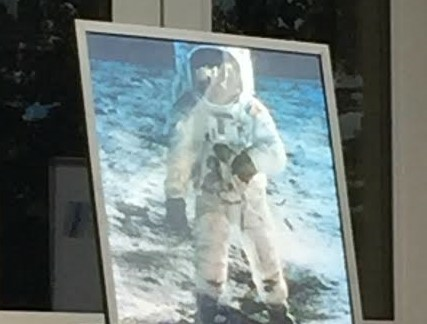 His mother, Marion Moon, was the daughter of an Army Chaplain and his father Edwin Eugene Aldrin was an aviation pioneer. Buzz graduated one year early from Montclair High School and he attended the US Military Academy at West Point, graduating third in his class with a BS in mechanical engineering. He then joined the Air Force where he flew F86 Sabre Jets in 66 combat missions in Korea, shot down two MIG-15′s, and was decorated with the Distinguished Flying Cross. After a tour of duty in Germany flying F100′s, he earned his Doctorate of Science in Astronautics at MIT and wrote his thesis on Manned Orbital Rendezvous. 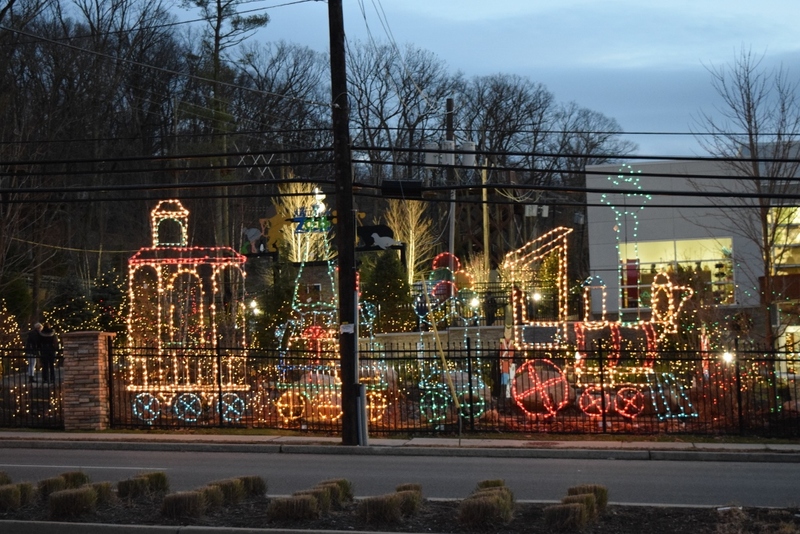 ESSEX COUNTY, NJ — One of Essex County’s favorite wintertime activities is returning to the Turtle Back Zoo in West Orange for 2017… the annual Holiday Lights Spectacular. 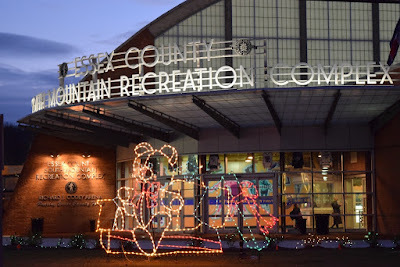 The display includes more than 100,000 lights shaped to look like bears, tigers and elephants, along with holiday lights designed to look like wooden soldiers, stars and winter scenes. 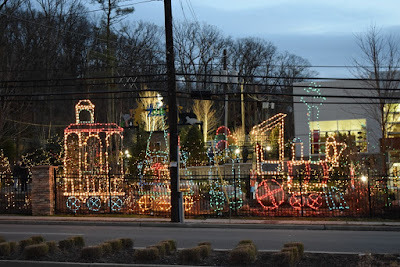 Come out and see the marvelous displays every Friday/Saturday/Sunday, from 5 to 9 p.m, from now until Tuesday, Jan. 3. Myrtle the Turtle - the mascot of Turtle Back Zoo - and several of his winter friends will be on hand to greet visitors at the zoo, officials said. The Essex County South Mountain Recreation Complex and Turtle Back Zoo is located at 560 Northfield Avenue in West Orange. For more information, call Essex County Turtle Back Zoo at 973-731-5800, or visit www.essexcountynj.org. We spoke to Mark Slade and he shared advice for people looking to sell or buy a home. 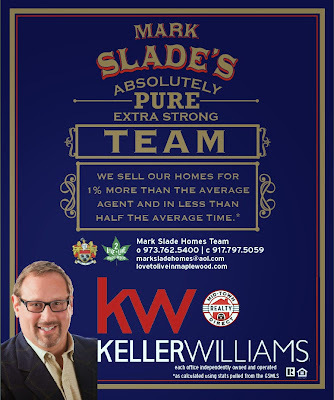 Patch partner Mark Slade of Keller Williams told us how he's stayed on top of the real estate industry and recommended three great books everyone should read. Patch: When did you first know you'd be good at selling homes? 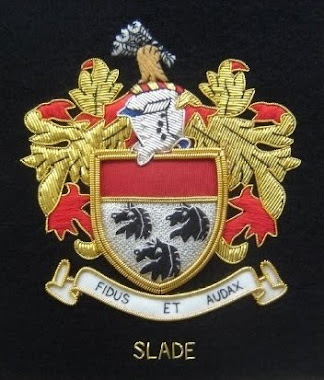 Mark Slade: Pretty much right off the bat. I have degrees in economics and fine art with some time in architecture school; little did I realize this would be the perfect variety of skills to enable me to be successful in real estate. Patch: How have you kept your competitive edge in the real estate industry? Mark Slade: I'm constantly searching for ways to grow my business and further advance my skills in marketing to buyers and for sellers. I teach social media marketing and blogging and that keeps me with my ear to the grindstone with any new techniques and such. Patch: If you had to recommend someone three books, what would they be and why? Mark Slade: "The Power of One" by Bryce Courtney was a great book to teach one to grow; "The Fountainhead" by Ayn Rand because I wanted to be an architect and now I'm working with architects as part of the equation of selling homes; "Brands That Rock" by Roger Blackwell was instrumental in helping me build brands for other companies I worked for like Swatch and Calvin Klein and then building my own brand: The Mark Slade Homes Team. Patch: What’s the strangest thing that’s ever happened to you while showing a house? 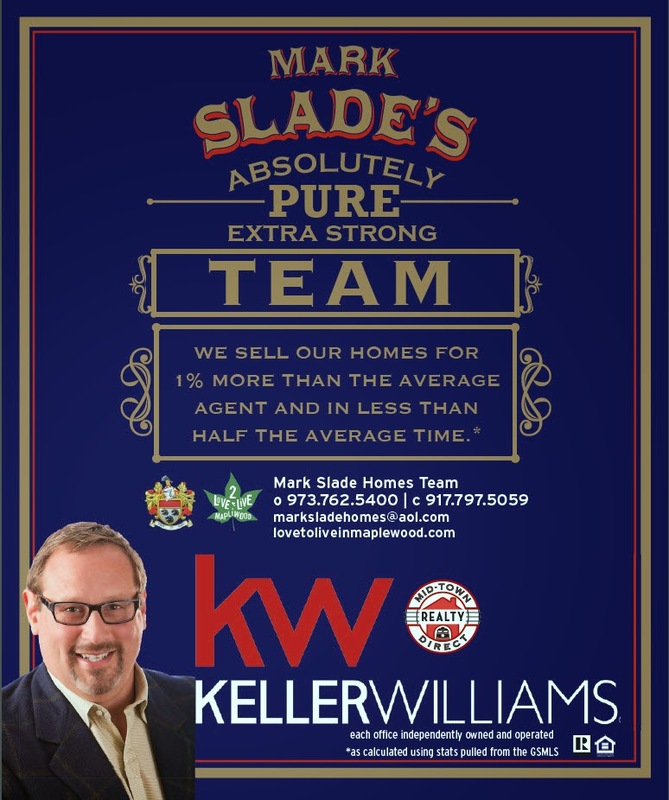 Mark Slade: The strangest event was when a seller let us into her home to show it and then decided to take a shower and stepped out of the shower as my clients were passing the open door to the bathroom. We joked about this every time we passed a bathroom on ensuing showing appointments. Patch: Can you tell us a bit about the area in New Jersey nicknamed West Brooklyn? Mark Slade: Two years ago, I was selected by the New York Times to give them the tour of Maplewood. During the tour, I mentioned how so many of our new home buyers are from Brooklyn and then blurted out: Brooklyn West. The moniker stuck and has been widely bandied about since then. It means that we have a very active and diverse community in terms of lifestyles, political beliefs, socio-economics and are heavily imbued with professionals of the arts -- actors, writers, photographers, graphic designers and more -- as well; our commute is the same time as it would be on the F train from Brooklyn Park Slope to Midtown. I even got custom license plates--BKLNWST--to celebrate. If we pass one another in town, please wave or honk to say hi. Patch: What's your definition of success? 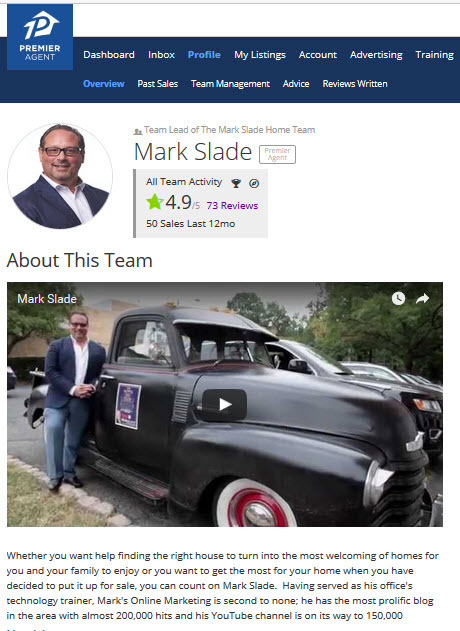 Mark Slade: For me, success can be defined in three parts: First, it was reinventing myself from a former fashion industry executive vice president who ended up being laid off, resulting in becoming a Food Stamp program participant and then embarking on a career in real estate which would lead to me becoming a leading and award-winning Realtor in Northern NJ specializing in the "train towns" served by Midtown Direct Train service. Second, building my brand has been a triumph in terms of breaking into a crowded field of agents and rising toward the top (with room for more growth). I love when people come up to me to say "Hi" that I haven't yet met and also thanking me for sharing my story of reinvention and lastly, being in a position to give back to so many charities to help those in need. Patch: What sets one realtor apart from another? Mark Slade: As a former brand manager, I was able to push hard to find my POD--Point of Difference. I practiced what I now teach to new realtors: Become a local expert. Know your market, be able to answer the proverbial question you will get asked: "How is the market?" Then layer on a dedication to listening and providing top notch service to your clients. Lastly, build a reputation and your own brand to stand apart from the competition. This can be done with testimonials, blogging and easy-to-use apps like Instagram. Patch: And how are you unique? 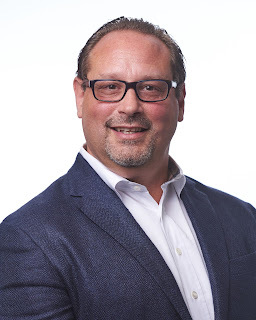 Mark Slade: I would like to think I'm unique in having had an education that prepared me to handle tough negotiations to the advantage of my buyers. I also can offer advice to help a new home buyer best visualize how to turn a house into the perfect home to fit their needs and budget. On top of that, I make a point of trying to stay connected with my past clients and remembering their key life events and home anniversary date so the relationship continues past the closing day. Lastly, I make it a prime focus to give back to charitable endeavors as well as sponsoring local events wherever possible to allow myself to build upon what I hope is a growing personal relationships with my clients. Patch: What’s your advice to someone who’s looking to a buy a new home right now? Mark Slade: Most buyers are doing so much of their own looking and some research online, which is a good start. However, finding the right agent to help them best understand the market, the terms, the experience of buying a home, especially when multiple bids are so common, is paramount to having the best home-buying experience. My team offers a complete suite of focused websites with home search, 30 town-specific open house sites which feature quick-find maps to help locate the homes you want to see, quick links to help you get to sites you need without having to navigate and drill down. Then we offer personal advice and professional project management to get you from purchase contract to closing, saving our favorite part for last: Taking your picture in front of your new home. Patch: What are you doing for Thanksgiving? Mark Slade: I drive up to Massachusetts to have Thanksgiving dinner with my family. Patch: What advice would you give someone trying to sell his or her house? 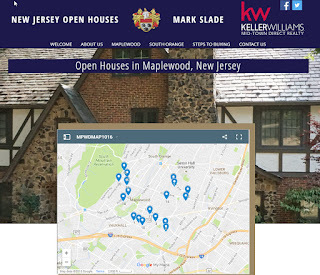 Patch: How can readers contact you and learn more about homes for sale in New Jersey? 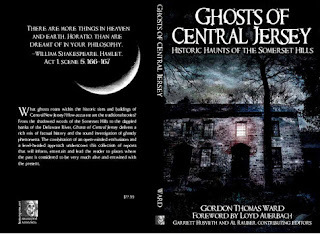 MAPLEWOOD, NJ – October 2016 – What is the real story on ghosts? You won’t find the answers in gothic novels, Hollywood movies, or on TV. 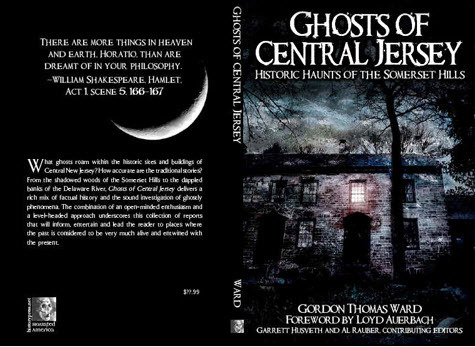 But Bedminster author and paranormal investigator Gordon Ward believes he has the scoop. He specializes in finding – and communicating with – beings on “the other side.” Survival of the human personality is a popular topic supported by mounting evidence. The word “ghost” is really an umbrella term that defines many types of paranormal phenomena such as apparitions and poltergeists. At 2:00 p.m. on Sunday, October 30, Gordon Ward will rivet audience members with “Ghosts: what they are and how to investigate them,” an expose of n his views on ghosts and his experiences investigating haunted locations, including the Old Stone House in Maplewood, He will show evidence including audio clips and photographs, and teach attendees how to conduct their own sound investigations without costly equipment. Questions are welcome. Also on October 30, from 1:00 – 4:00 p.m. visitors can catch the exhibit, From Farm to Suburb: The Birth of College Hill, which explores the evolution of a section of Maplewood from a dairy farm to a popular neighborhood of 300 houses. Out in the carriage house the Country Store will be selling historic-themed treasures: early American children’s games, books and toys, facsimile documents, quill pens and ink, historic cook books, cookie molds, reproduction ceramics, hiking sticks and more. The hard-to-find original Doors of Maplewood poster, Smile, the history of Olympic Park, the new acid-free reproduction of the charming 1931 map of Maplewood, local honey and Original 1910 Chocolate Fudge Sauce will also be available. Open Saturdays and Sundays 12 to 5 p.m.
Durand-Hedden House is dedicated to telling the history of the development of Maplewood and the surrounding area in new and engaging ways. It is located in Grasmere Park at 523 Ridgewood Road in Maplewood. The Country Store features unique books, maps, and gifts of historical interest, and is open on weekends from noon to 5:00pm. For more information or to arrange group tours call 973-763-7712. You can also visit our website at durandhedden.org and find us on Facebook and Twitter. set up an electric light company in Newark. And, while your out enjoying this tour, swing by our latest West Orange Home for Sale at 38 Aspen Road. This Renovated Home, with its HGTV-inspired design, is such a pleasure to see and maybe buy? Acclaimed Singer-Songwriter, Josh Ritter, to Perform at SOPAC November 9 at 7:30 p.m.
Tickets: $38-$55 To purchase tickets, contact SOPAC at (973) 313-2787 or visit www.SOPACnow.org. 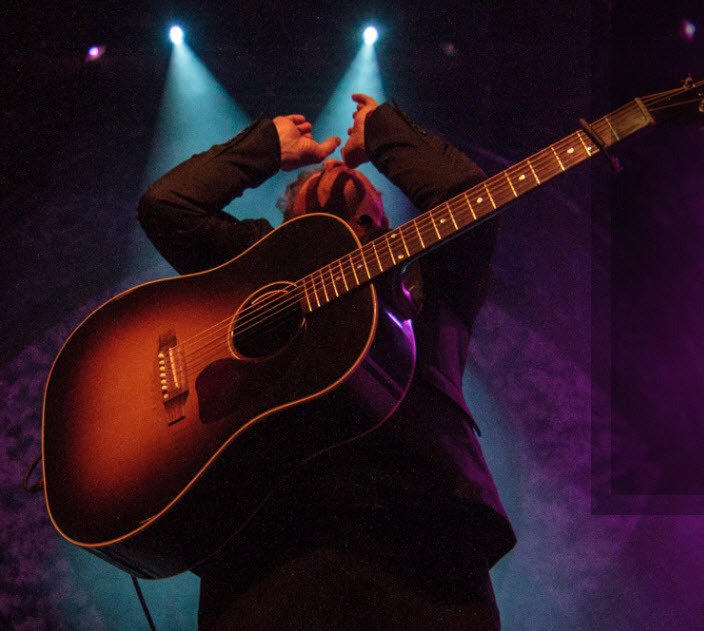 (SOUTH ORANGE, October 18, 2016) Popular Folk singer-songwriter, Josh Ritter, returns to SOPAC November 9 at 7:30 p.m. Known for his strong voice, keen wit, and evocative way with words, Ritter has quickly taken his place as one of the most acclaimed young songwriters of his generation. Josh Ritter takes the SOPAC stage November 9 at 7:30 p.m. Tickets are $38-$55 and can be purchased online at SOPACnow.org/josh-ritter, or by calling the box office at (973) 313-2787. SOPAC programs are made possible in part by the New Jersey State Council on the Arts. The South Orange Performing Arts Center (SOPAC) is a 501(c)(3)charitable organization. SOPAC received funding through a grant from the NJ Department of State, Division of Travel and Tourism, visitnj.org. Since 2006, SOPAC has been serving as a premier performing arts center in the region. SOPAC offers innovative artistic and cultural experiences for diverse audiences in an intimate, inviting environment. The premier arts center hosts a variety of live performances, community events and education programs for all ages. To further expand its offerings, SOPAC has a partnership with the Juilliard School of Music to present Juilliard @ SOPAC—a series featuring upcoming musicians from the acclaimed conservatory. 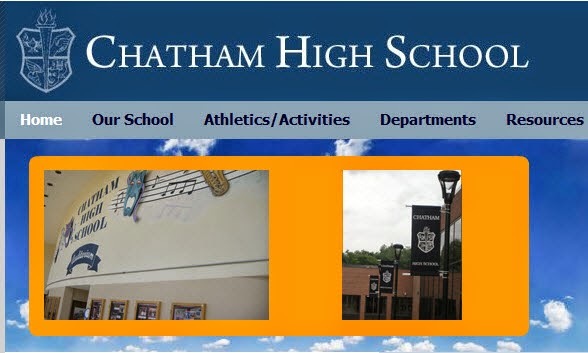 SOPAC is home for Seton Hall University Arts Council’s performances, including Classical Concert Series, Jazz N’ the Hall performances and Seton Hall Theatre productions. SOPAC also presents performances by its theater company in residence, Midtown Direct Rep. For more information, visit SOPACnow.org. 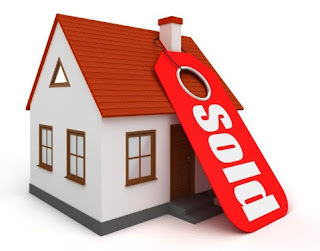 If you are considering selling your home and you want to sell it quickly, the best strategy is to hire an top rated listing agent who is experienced and demonstrates knowledge of your market area. It is important that you do not fall for gimmicks, including various companies that will take the home off your hands for next to nothing. Rest assured that you have options and that there are strategies to sell your house quickly without giving up value. Most of us aren't capable of fixing our own cars or treating our own medical issues, we seek out proven professionals, well the same should apply to one of your biggest assets--your property--if you truly want to get the most for your money or sell for the terms that best apply to your situation. I'm proud to say that I have either sold or accepted offers on some of my most recent listings that got my sellers as little as 10% above asking to as much as 13% over ask, as the expression goes, and on the first weekend. While not every listing sells for as much or as quickly, we have consistently made a habit of out performing the agents doing business in the same overall territories. If you want to get a glimpse of how we do it, CLICK HERE. So why are Homeowners are sometimes talked into selling their homes on their own by uneducated--in a real estate way--friends? Because they are ill advised in thinking that bypassing the process of hiring a listing agent or a broker will save them time and money. But in reality, it’s the opposite. Statistics show that the typical FSBO home sold for $210,000 compared to $249,000 for agent-assisted home sales, according to the NAR. That difference represents 18.5% more in a seller's pocket! The reasons are clear, you don't get nearly as much of the online exposure as needed in an age when buyers are doing so much of their advanced home scouting online and you are also somewhat disconnected from the thousand's of local agents that have the knowhow and expertise to help manage a transaction from is inception to its closing. I hosted an open house this weekend and has a total of 33 sets of visitors, more than half were buyers who came to check out the home and who weren't working with an agent yet, meaning they were still in the earlier stages of their search. However, three of these buyers have advised they will be putting in an offer on the property. •Research the home prices in your area so that you are well informed on what your home is worth well before you list it for sale. It’s a good idea to check out some Open Houses to see with your own eyes what agents do and how prices equate to the value of location and condition. Your agent will recommend a listing price and if your goal is to sell your house quickly, it may be lower than it would be otherwise. Make sure you’re informed and then listen to your agent and lean on their industry knowledge and expertise. Keep in mind that holding back on relevant information you may have is putting your agent at a disadvantage. •Not to be redundant, your listing agent will advise you on how best to stage your home, which can make another 7% difference in your pocketbook. Keep in mind that today's buyers are so guided by HGTV and looking for homes that have the look and feel in their favorite shows. Your home may be beautifully decorated but it may not be considered by the vast majority of HGTV minded buyers out there and this could adversely affect your results. •Holding Open Houses helps to more easily manage the property for preparedness, increases availability, and funnels activity and the excitement to get your property sold quickly. •Upgrade but don’t overdo it – you may have to undergo some necessary repairs and upgrades, but don’t overdo it. Your agent should be able to provide advice on what "investments" will actually give you ROI-Return on (your) Investment. A good agent can often get you that much more for your property by making a few simple changes. •Last, but not least: let's say your friend or relative is a newer Realtor, which could mean they don't have the experience and know how to help you best achieve your goals? Well, ask them to either partner with a Zillow Top Agent or get involved by having your agent pay them a referral and make it a provision they be allowed to shadow and learn from the more experienced professional.